Including Zoomable Map, Satellite View, and door to door Driving Directions. Taconic Parkway North to Route 23 East Exit. 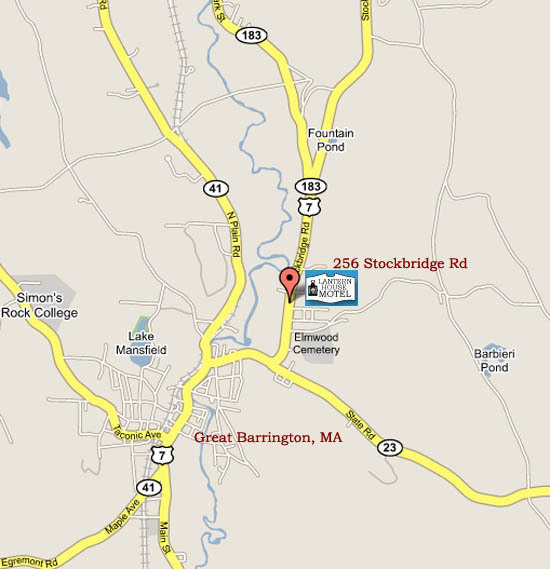 Take Route 23 East across the Massachusetts/NY Border to the intersection of Route 7 in Gt.Barrington. Turn north (left) on Routes 7 & 23 approximately 1 mile through the town of Gt. Barrington. Follow 7 & 23 across the bridge approximately 0.5 miles to traffic signal where Route 23 separates. Stay on Route 7 (bearing left) continuing approximately 0.5 mile North on Route 7, the Lantern House Motel is on the right. From I-684, travel North to Brewster, NY where Route 22 North continues. Follow 22 North to Hillsdale, NY and turn right onto Route 23 East. Continue East across the Massachusetts/NY Border to the intersection of Route 7 in Gt.Barrington. Turn north (left) on Routes 7 & 23 approximately 1 mile through the town of Gt. Barrington. Follow 7 & 23 across the bridge approximately 0.5 miles to traffic signal where Route 23 separates. Stay on Route 7 (bearing left) continuing approximately 0.5 mile North on Route 7, the Lantern House Motel is on the right. From the North In Massachusetts, take Route 7 South to the approach to Gt. Barrington. the Lantern House Motel is on the left after the Price Chopper/K-Mart shopping center. From Hartford: Route 44 West to Canaan, Route 7 North to Gt. Barrington, MA. Continue north on Routes 7 & 23 approximately 1 mile through the town of Gt. Barrington. Follow 7 & 23 across the bridge approximately 0.5 miles to traffic signal where Route 23 separates. Stay on Route 7 (bearing left) continuing approximately 0.5 mile North on Route 7, the Lantern House Motel is on the right.